Where are the kids hanging out? Whilst on a conference call with some colleagues today I was asked if I felt that young people were no longer on Facebook. They had been told by an agency that ‘the kids’ were no longer using the social media website being drawn to SnapChat and other social sites. It is about a year-and-a-half since there were many stories around predicting the demise of Facebook saying that young people were avoiding the site because it was now full of oldies. However this has not been my experience and whilst yes like people of all ages they are using a variety of sites and apps to communicate with their friends and family – they are still there. 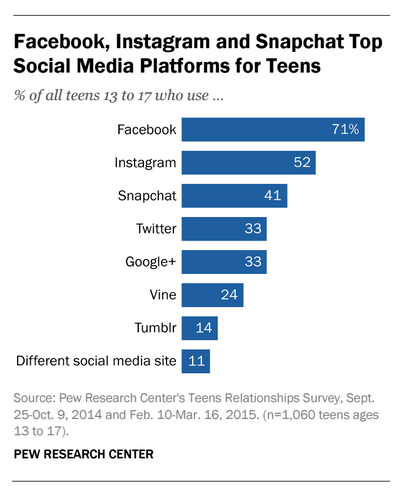 Polling by Pew Research backs up the fact that Facebook is still the leader with 71 percent of young people aged 13 to 17 saying they use it. Social media attention spans have been spread thinner in recent years, with only 41 percent say it’s their “most visited site.” I do wonder though if some usage via Facebook’s Messenger and app use might not twig in their minds as visiting the site. Either way Facebook still commands significant influence in this age range. The fact the second biggest network is Instagram (owned by Facebook) means Facebook’s dominance of social media is not going to disappear anytime soon. In looking to target young people Facebook is still a great place to be. Yes there are other social networks that they hangout, however the ability to advertise on many of these is still limited. You also need to think about how your brand or product will behave within these networks where traditional forms of advertising will be out of place and have little to no impact.